The following rules & guidelines clarify the kind of behaviour that is expected from English players, and include disciplinary & appeals procedures for dealing with instances of unacceptable behaviour. 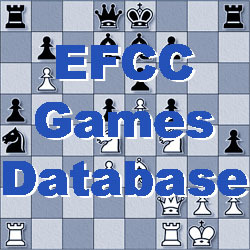 These procedures deal specifically with EFCC events, or ICCF Team tournaments / friendly matches where a player is representing England. Any penalties / sanctions imposed by the EFCC Disciplinary Sub-Committee will relate only to EFCC events or England Team Matches / Team tournaments. For individual players playing in ICCF tournaments or other non-EFCC events, the ICCF Rules & Code of Conduct will take precedence & must be followed. Whether it is in games with playing partners or communication with tournament directors (TD) or any Officials, players are expected to be friendly in all communications, bearing in mind that we are playing a game and TDs are all volunteers who are trying to promote bonds of friendship and sportsmanship. All players / Team Captains must respond to requests from TDs or other EFCC officials in a prompt manner. Players should observe the Playing and Tournament Rules carefully. Care should be taken to observe advance notification of leave, time exceeding claims, etc. Any disputes by a player must, in the first instance, be communicated to the official TD of the tournament (except in team events, where the team captain (TC) should be the point of contact). Abusive remarks made to any player, EFCC official or ICCF official is never acceptable. Defaulting games on time is disrespectful to other players, officials & EFCC. Players who default on time must expect to be questioned by an EFCC official as to the reasons for such default. Defaulting games on time whilst representing England in a friendly match or Team Tournament will be regarded as a very serious breach of expected behaviour. Any breach of the above should usually be referred to the EFCC Disciplinary Sub-Committee by the TD or the Team Captain concerned. Players who default on time, or breach the above guidelines in any other way, must expect to be questioned by the TD/TC as to the reasons for such default. If a satisfactory reply is given, the TD/TC need take no further action other than reporting the matter to the EFCC Secretary for the purpose of maintaining a database. However, it should be noted that “satisfactory replies” to a default should be few & far between. Generally speaking, defaults are unacceptable in the vast majority of cases. If the reply is unacceptable, or there is no reply, the matter should be referred by the TD/TC to the EFCC Disciplinary Sub-Committee. Any further developments involving that player in the same tournament should be immediately reported to the EFCC Disciplinary Sub-Committee. i) Formal written warning. Continuing or repeated misbehaviour will result in (ii) being implemented. ii) Disciplinary action with penalties / sanctions imposed by the EFCC Disciplinary Sub-Committee. (a) A serious behavioural issue, e.g. silent / unacceptable withdrawal from a tournament, unacceptable, or abusive behaviour to players / officials as a first offence – ban from all EFCC tournaments and activities for a period of 2 years, from the date of decision. (b) A repeated serious behavioural issue, e.g., repeated silent / unacceptable withdrawal from a tournament, repeated abusive behaviour to players/officials – ban from all international CC tournaments and activities for a period of 5 years, from the date of the latest decision. (c) Outrageous behaviour or further repeated behavioural issue, e.g., theft, belligerent action towards EFCC or any of its officials, assault, etc. – ban from all EFCC tournaments and activities for life duration. Appeal for remission of sentence is available after 10 years. When dealing with disciplinary matters and considering penalties / sanctions, care should be taken to ensure consistency and those penalties are commensurate with the “crime” committed. In all cases of disciplinary action, an individual has a basic right to express his / her case, with reasoning, before a decision is taken. It is unacceptable for an individual to ignore requests from a TD, TC or the EFCC Disciplinary Sub-Committee. When disciplinary action is taken, the reason must be given in writing by a member of the EFCC Disciplinary Sub-Committee and any sanction or penalty imposed must be clearly stated, along with any available appeals procedure, should the recipient be unwilling to accept the decision. The EFCC Secretary will maintain a database of all cases that have been the subject of disciplinary action or application of sanctions, and all appeals thereon. Should a player be unwilling to accept the decision of the EFCC Disciplinary Sub-Committee, he / she has the right to Appeal to the EFCC Executive Committee. Such an appeal must be made within 7 days in writing (by email or post) to the EFCC Secretary. The decision of the EFCC Executive Committee is final.